Are you ready for the big game? I know I am. I come from a football-watching, smack-talking family. We love football. I mean, LOVE. We have draft parties in the Spring (which is usually around my birthday, double yay for me!) and buy the Sunday package from our satellite provider. We cover our beds with football-themed blankets in the fall and weep every winter when football is over. Basically, we're depressed from February until August when pre-season football starts. We're the first ones to plan our work and vacation schedules around our favorite team's schedule. We go to a few games a year (if we can) and we're the annoying people with flags on our car and window spray paint on our back windshield, talking junk to the other drivers as we drive by on game day. I've got the day off from work on February 1, I've already retrieved my team's jersey from the dry cleaners, cued up the DVR (for those memorable play-back moments we just HAVE to see again) and dusted off the remote for some hot football-on-tv action. My favorite teams won't be playing in the big game, so for me--it's all about the food and the commercials. Does anyone really watch the game for the gridiron action anymore? No matter because this week I've been selected alongside of members of the #SundaySupper crew to create some "Supper Bowl" appetizers featuring Gallo Family Vineyards wines. 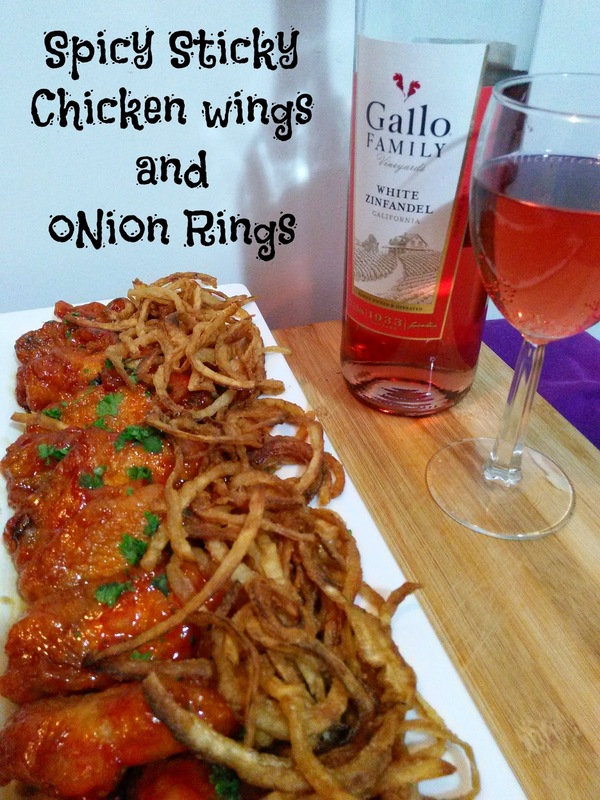 I'm making Spicy Sticky Chicken Wings and Onion Rings to pair with Gallo Family Vineyards White Zinfandel. I'm not sure why, but wings always taste better with football, friends and adult beverages. 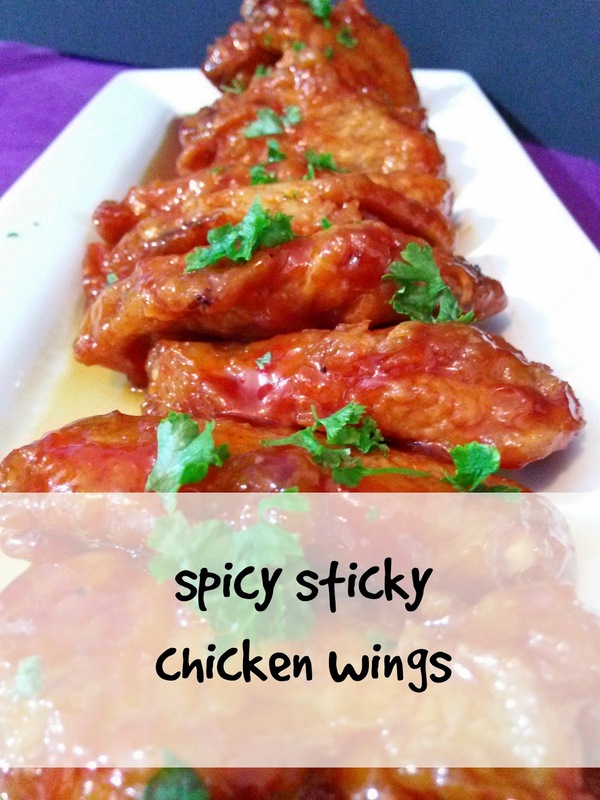 My wings can be made in a slow cooker or the oven. They're baked in the oven and then simply tossed with a sweet yet spicy sauce and garnished with onion rings. But these aren't just any old onion rings. They're tobacco onion rings. They're called this because they're sliced thin, battered and flash-fried until they look like shredded tobacco when they're done. I'm from North Carolina where tobacco used to reign king and they are a treat when served on anything. Served alongside the meaty, juicy wings hot from the oven, the onion rings add another layer of spice, crunch and turn the wings appetizer into decadence that you normally wouldn't have for game day appetizers. Now is the time to go over the top and pull out all of the stops. I'm my opinion, most wings are fried on game day because it's easier to dump batches in a hot vat of oil than to carefully lay them in a single layer, watching them and flip them over as they crisp up in the oven. Also: I prefer the flat part of the wing (called flats) compared to the cutesy little drumettes. There's more meat in the meat-to-bone ratio and if you purchase them in bulk, they're less expensive. Little known fact: The flats are where it's at. Whether you're hosting or traveling with your appetizers to a pot luck game day situation, Gallo Family Vineyards wines are the perfect foil to the perfect game day foods. The classic bright fruit flavors of White Zinfandel will help cool your mouth from the spicy zest of the wings and onion rings. Do you need help planning? Click here to find football finger foods courtesy of Gallo Family Vineyards. Preheat oven to 400F. Layer chicken in 2 baking pans covered with aluminum foil, in a single layer. Bake for 20 minutes, flipping halfway through. Meanwhile, in a large skillet on the stovetop, add the ginger, chiles, soy sauce and cook over medium heat, stirring, until fragrant, about 1 minute. Add the Gallo Family Vineyards White Zinfandel, oyster sauce, mirin, sugar and 1/3 cup of water and bring to a simmer over moderate heat. Cover and simmer for 10 minutes. Uncover and cook over moderately high heat, stirring occasionally, until the sauce comes to a thick glaze, about 8 minutes. Discard the chiles, transfer the chicken wings to bowl and pour the sauce over them. Toss the wings in the sauce using tongs until the wings are completely covered. 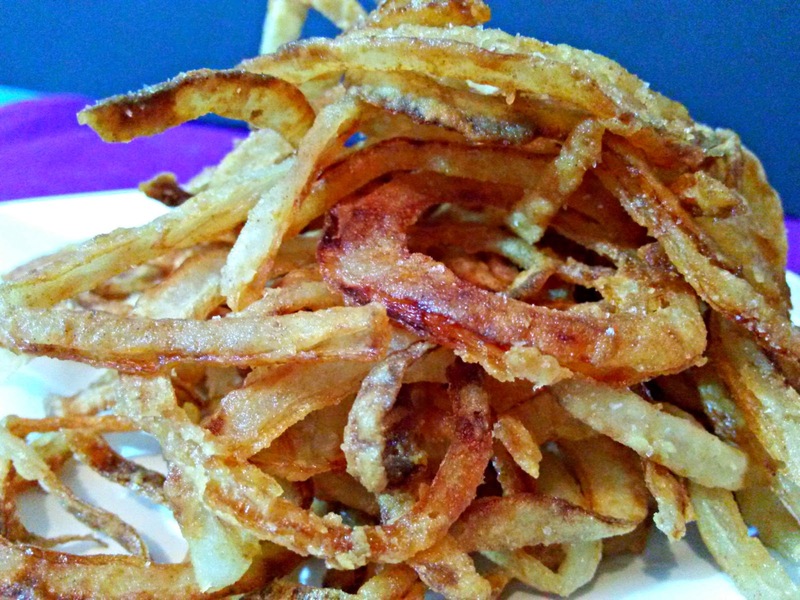 Scatter the onion rings on top and serve on a platter or other serving dish. Slice onion very thin using a mandolin or a sharp Chef's knife. Place in a large bowl and cover with buttermilk and hot sauce for one hour. Heat oil in a Dutch oven or large stock pot to 375 degrees. Dredge a handful of onions in the flour mixture, shake off excess flour and buttermilk, and lower the battered onions into the hot oil. Fry for 3-4 minutes and remove as soon as golden brown. Repeat until onions are gone. Season with salt, serve immediately. Awesome flavors in this! I don't know which I like more - the wings or the rings. I guess I'd have to eat a bunch of both. 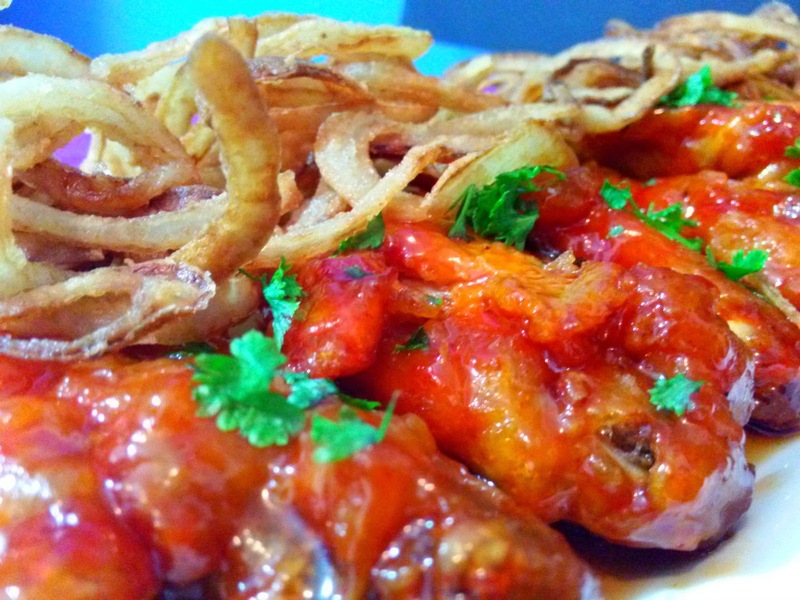 I love the idea of pairing saucy wings with crispy onions! Yum! Oh, boy, where to put my fork first??? Your sticky wings look irresistible, but I can never resist crispy onion rings! What a spectacular pairing!!! It sounds like my husband would fit right in with your family! These wings look and sound sooo good! Mmmm, this is such a tasty combination. Love wings and those onions would be a real treat! Ohhh I just want to dig right into that platter!! Chicken wings AND onion rings?! You've definitely created the perfect game watching spread. What a perfect combination you have going on here...yum! My husband plans his entire life from September through December around college football, so I totally get it! And wing sauce with White Zin - I must make this for my mom! I really like sticky wings and these have me drooling! I'm loving the onion rings as well. I'm with you - it's all about the commercials (and the Puppy Bowl...lol)! These wings look awesome! I love the crispy onions on top...mmmm! WOW! this sounds really yummy! Yummy, yummy, yummy! I love this recipe, Nikki! Can't wait to try! I'm not sure which I'm drooling over more the wings or those thin-sliced onion rings! I'll take some flats please!!!! You just can't beat a good plate of wings on Super Bowl Sunday. And how I love a good onion ring! Can you just pass me that plate, please? Holy yum! Chicken wings with wine?! That sounds amazing! Perfect for Sunday. That's it - I want an invitation to your house just so I can eat THIS FOOD! Well helllloooo chicken wings!!! These sound brilliant, as do the onion rings. Basically, I want them all. Both recipes look extremely delicious! Sticky wings and onion rings!! LOVE! I'm definitely READY! Yumm. Excellent for lunch or dinner.